On February 3, members of Fossil Free Macalester presented their proposal for fossil fuel divestment to the Social Responsibility Committee (SRC). 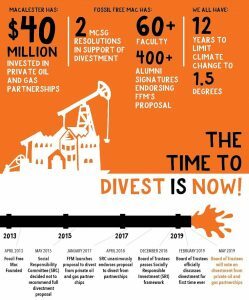 The campaign, which started about two and a half years ago, is asking Macalester to divest its endowment from the fossil fuel industry. Presenting to the SRC is the first in a series of steps that need to be taken by the campaign in order to gain approval from the administration. “Once [our proposal] is approved, it will be sent on to the president, and, if he approves it, will be sent on to the Board of Trustees. They’re the ones who can make the final decision and say, ‘yes, we’ll divest from fossil fuels,’” Sonia Pollock ’15 of Fossil Free Mac said. The campaign has already gained the backing of over 1,200 students via a petition. In addition, MCSG passed a resolution in support of the campaign two years ago. The movement is continuing to gain student support. Last Friday, members of Fossil Free Mac hosted a Valentine’s Day photo petition to coincide with Global Divestment Day. Other colleges around the country have already divested, and many other have ongoing campaigns similar to Macalester’s. Last week, students at Harvard hosted a sit-in at their president’s office in response to her refusal to continue negotiations with them. Several other colleges have already divested, including Stanford University and Pitzer College. “The national movement is really making powerful changes to the strength of the fossil fuel industry,” Pollock said. “The main idea is asking Macalester to divest their endowment from fossil fuels, which would mean looking at our investments and asking our endowment managers to shift our endowment away from the top 200 companies with the most fossil fuel reserves,” Pollock explained. The tough part for Fossil Free, however, is that at the moment, it is not clear which companies the college is invested in. The campaign organizers will be attending a follow-up meeting with the SRC in March, where they hope to gain the committee’s approval. Afterwards, the campaign will move forward to present to the college’s Board of Trustees. Although a hard road lays ahead, the campaign’s organizers remain optimistic.